Volume > Issue > American Religion: Patriotic or Critical? Review Author: James J. Thompson Jr.
James J. Thompson Jr., a Nashville-area writer, is Book Review Editor of the NOR. His latest book is Fleeing the Whore of Babylon. An Invitation to American Cath­olic History. By Martin E. Marty. Thomas More Press. 221 pages. $14.95. Haven and Home: A History of the Jews in America. By Abra­ham J. Karp. Schocken. 401 pages. $9.95. Religious Outsiders and the Mak­ing of Americans. By R. Lau­rence Moore. Oxford University Press. 243pages. $24.95. In 1987 Americans will commemorate an epochal event: 200 years ago, in the oppressive heat of a Philadelphia summer, 55 men bargained, bickered, and compromised their way to the founding document of the Unit­ed States. In celebrating the drafting of the Constitution, Americans will reaffirm the bless­ings of united nationhood. For two centuries we have preserved the common endeavor fashioned by the men of ‘87; through the trials of continental expansion, fratricidal warfare, industrializa­tion, urbanization, massive immi­gration, foreign strife, and eco­nomic boom and bust, we have remained one people: E pluribus unum. The unum can be decep­tive, for as this anniversary ap­proaches we disagree not only on where we have been and where we are, but on where we should go. Fireworks, encomia to liber­ty, and self-congratulatory proc­lamations will not erase the dis­quiet and division among our people. Religion, and the political and social frictions it engenders, lies near the heart of our discon­tent. Who speaks for the soul of America? Are we a Christian peo­ple? What role does the United States play in the divine scheme? Such questions fall easily from the lips of Americans. In search­ing for answers we confront — either to accept or deny its verac­ity — a venerable mythology that still wields considerable author­ity. It runs something like this: America was born as a haven from the religious fracases and persecutions of Europe. The col­onists tamed the land, prospered, and grew in numbers. John Winthrop’s “city upon a hill” waxed strong under the superin­tending eye of God. A century and a half after the Puritans step­ped ashore at Massachusetts Bay a God-fearing and freedom-loving people rebelled against a foreign oppressor and forged 13 colonies into a nation united under God, a land of some religious diversity, but most assuredly Christian. Throughout the next century these Christians strode from suc­cess to success; with God’s bless­ing they carved out a great na­tion on this continent, and in the early 20th century it emerged as the supreme Christian country on earth. America was the New Israel, chosen of God to imple­ment providential design. Somewhere in the 20th cen­tury — so the mythology contin­ues — the snake slithered into the garden. The robust self-assurance that had spurred Americans to­ward an ever-brightening future attenuated. Beset by internal dis­cord, foreign foes, and a slacken­ing of self-confidence, Christian America shuddered on its foun­dations. By the penultimate dec­ade of the century some Ameri­cans were feverishly laboring to shore the edifice against ruin, others standing by nonchalantly to see if it would topple, still others gleefully pitching in to hasten its crash. 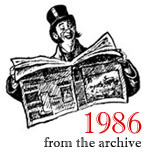 If most Americans anticipate 1987 as an occa­sion for celebration, some of them prepare to mark the event in mourning for a once-proud Christian nation now inextric­ably mired (to switch metaphors) in the quicksands of secularism. In The First Liberty William Lee Miller strikes at the vitals of this reading of the American ex­perience; to put it bluntly: the men of ‘87 were not Christians. With his scholarly eye trained mainly on Jefferson and Madi­son, Miller argues that the Founders were Deists, propo­nents of an Enlightenment creed that ill-suits them to be hailed as formulators of Christian nation­hood. That Deism roiled the in­tellectual waters of the time can­not be denied; Jefferson and Franklin, for example, richly de­serve the tag. But to ascribe such views to the Founders as a whole is a problematic exercise, given that 55 men — Jefferson not among them — participated in the Constitutional Convention. M.E. Bradford, in a recent book entitled A Worthy Company, painstakingly scrutinizes the reli­gious beliefs of the delegates and finds more Christians than Deists among them. Since Deism was not an organized religion but a loose set of cosmological and ethical principles, it is often diffi­cult to pin down who was and who wasn’t a Deist. Miller counts George Washington as one; Brad­ford points to the General’s lifelong adherence to Anglicanism as evidence of his Christianity. For every Jefferson or Franklin who slides easily under the rubric of Deism, there are 10 others whose beliefs are more ticklish to cate­gorize. Miller’s Founders — secular-minded men who wore their Christianity lightly, if at all — bear little resemblance to the Bible-believing statesmen who populate the fundamentalists’ pantheon. For Miller, the key Founders were secularists who erected a Jeffersonian wall to keep the state neutral in religious matters. The villains in the story, as he relates it, are evangelical Protestants — Baptists and Meth­odists especially — who, in the wake of the surging piety and ef­fervescent revivalism of the Sec­ond Great Awakening of the ear­ly 1800s, “soaked the nation’s culture” with their enthusiastic religion. They distorted the teachings of the Fathers, appro­priated them to their own ends, and created a Protestant “estab­lishment” that insisted that pub­lic institutions, notably the schools, nurture their brand of Christianity. Protestant hegemo­ny lasted well into the 20th cen­tury; the Religious Right repre­sents a last-ditch effort to restore evangelical primacy. Although Miller claims that strict separation of church and state implies no hostility to reli­gion, he admits that its architect, Thomas Jefferson, endeavored to replace “the old communal and social role of an established reli­gion” with a “civic republican system”: religion must surrender to political ideology. Those recal­citrant fundamentalists, whom Miller scores, perceive this. They may be lamentably unsophisti­cated and a mite frantic in their denunciations of secular human­ism, but they correctly discern that those who most fulsomely laud state neutrality are often the same ones who would kick religion out the front door, while leaving the back door ajar so that an ideology hostile to the sacred can sidle in. Miller is no jaundiced secu­larist who longs to cleanse Amer­ica of religion’s baleful influence. He suggests, for example, that Catholicism could leaven repub­lican theory and practice with a “personalistic communitarianism” to offset the “individualist­ic libertarianism” of Protestant sectarianism. However gratifying Catholics might find this tribute to their Church’s teachings, it is at bottom the time-worn social-utility notion in new guise. Even Benjamin Franklin, arguably the most thoroughly secular Ameri­can statesman of his era, believed that Christianity was good for the masses: by checking their baser impulses and schooling them in sobriety and orderliness, it transformed them into tract­able citizens. Miller’s praise of Catholicism partakes of this tra­dition. The transcendent truth of Catholicism — or of any version of Christianity — is irrelevant; what matters is religion’s efficacy for the public weal. In criticizing Marty I intend no dispraise of church-state sepa­ration or religious pluralism. No more than him would I want pa­pal dictates or the pulpit pro­nouncements of Baptist preach­ers to carry the force of legisla­tion; integralism boasts few fol­lowers in the U.S. Pluralism and state neutrality have served America well in most respects. They have shielded unpopular re­ligious minorities — Mormons, Jehovah’s Witnesses, Seventh-Day Adventists — from the ire of more numerous Christian bodies. They have imbued America with religious liveliness, a vitality that has not only benefited individu­als, but, when transposed into humanitarian causes, has amelior­ated worrisome social afflictions. Moreover, as Abraham Karp shows in Haven and Home, plu­ralism has encouraged Christians to accept Jews as members of an­other religious group, free to practice their faith, rather than regard them as pariahs to be har­ried from the and. Despite the anti-Semitism that has flourished at times in the past — and still exists, albeit more surreptitiously — “Jews in America,” writes Karp, “early felt that freedom and equality were theirs in full measure.” Pluralism and church-state separation have enabled Americans to escape much of the turmoil, contentiousness, and murderous rage that have soaked much of the world with the blood of religious minorities. Admitting all these boons, one still feels a tug of uneasiness, a sense of “yes, but…. ” The American way has permitted ev­ery imaginable variety of reli­gious experience to thrive on these shores, but concurrently, it has promoted consensus in the interests of Jefferson’s “civic re­publican system.” As many com­mentators — most notably Rob­ert N. Bellah — have pointed out, America’s religion is not Chris­tianity but republicanism. Men and women of strong religious conviction may cultivate their spiritual ardor privately, but as actors on the public stage they must adhere to Caesar’s religion. By Marty’s reckoning. Catholics become authentic Americans by conforming their Catholicism to American norms; Washington, not Rome, is the eternal city. Miller calls upon Catholics, Prot­estants, and Jews to contribute their particular insights to an amalgam that will provide Ameri­ca with “the necessary base for a true republic in the interdepen­dent world of the third century of this nation’s existence.” The religion of republicanism lures one toward a patriotic spiritual unity. Whether the Founders were Christians or not is perhaps irrel­evant in this late stage of the re­public. With secularists in the saddle, Moore’s “outsiders” might consider a different strate­gy: rather than clinging to a threadbare mythology of nation­al blessedness, they might re­claim their “outsiderness” and proclaim the news that those who invest their love in a society fabricated by man risk forfeiting their citizenship in the eternal City of God. ©1986 New Oxford Review. All Rights Reserved.